Depending on your age, the phrase “it takes two” could either make a dream come true or make a thing go right. For those who use SR 524/Filbert Road in south Snohomish County, they hope it takes two roundabouts to make a safer commute between Bothell and Lynnwood. 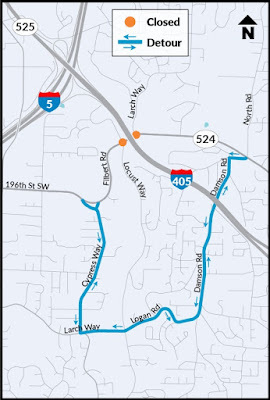 In order to make that happen, contractor crews with A-1 Landscaping and Construction, Inc. need to close SR 524 for two whole weekends while they build brand new roundabouts at Larch and Locust ways. 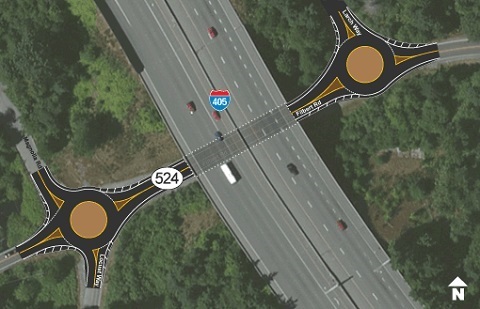 The new roundabouts will be located on SR 524 on each side of I-405. This illustration shows what the Locust Way and Larch Way intersections would look like with roundabouts. The closures will happen from 8 p.m. Friday to 6 a.m. Monday on Sept. 21-24 and Oct. 12-15. Crews will work on the Larch Way intersection during the first weekend closure, then the Locust Way intersection during the second weekend closure. 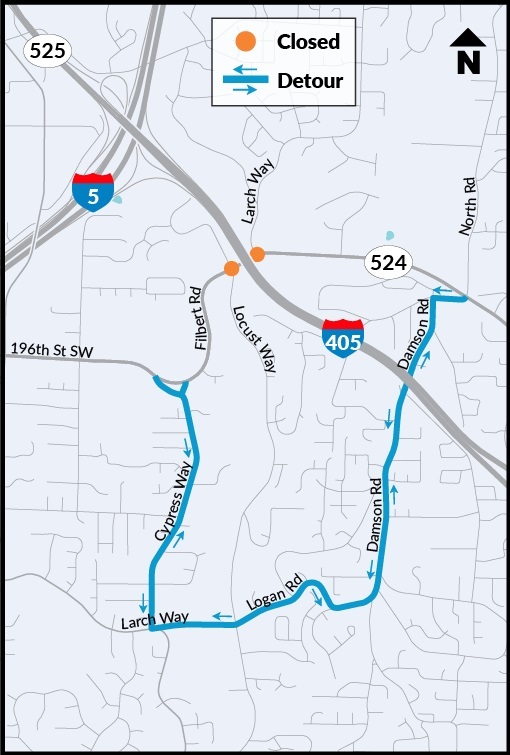 Detours will be in place for local residents as well as cars, small trucks/buses and cyclists who use SR 524 on the weekends. There will also be a separate detour for larger commercial trucks. All detours will be signed, but travelers should prepare to add some extra time to their trips while the detours are in place. From 2011 through 2015, there were 81 collisions at these two intersections that injured 36 people. This was a higher collision rate than the state average for highways of similar size and capacity. Many of these crashes happened while vehicles stopped on SR 524 to make left turns. Roundabouts have a proven history of reducing collisions and their severity because they encourage lower travel speeds and keep traffic constantly flowing. This prevents travelers from speeding up and trying to “beat the light,” like they might at traditional intersections. 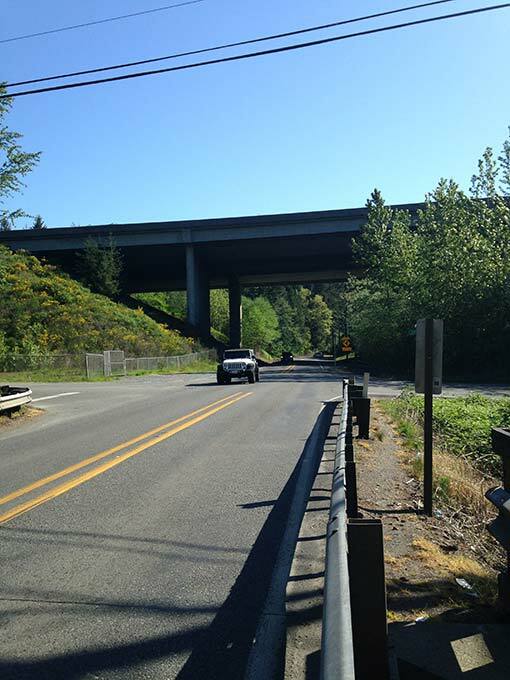 This is great news for the 16,000 people who use this stretch of SR 524 every day. Many of you may be wondering why we choose to build roundabouts at these intersections rather than installing left turn lanes or traffic signals. We considered six different options – including the ones I just mentioned – and most required a wider highway to implement them. highway, resulting in collisions and traffic backups. Widening the highway would cost substantially more money than is currently available because crews would need to address two creeks, a wetland, a narrow bridge built in 1935, right of way, and the columns that hold up I-405. On top of that, roundabouts are less expensive to maintain compared to traffic signals and produce fewer greenhouse gas emissions due to the lack of acceleration in and out of the roundabout. Be prepared for the drive between Lynnwood and Bothell to take longer than usual. Sign up for weekly email updates on Snohomish County projects. We know there’s no good time to close a highway, and we thank you in advance for any adjustments you make to help us complete this important safety project on SR 524. Lol, love your opening sentence! My first drive through the first completed round-about "made a thing go right"! And the drive back was even better! I've always thought I would not like having to deal with Filbert Rd should I live near it...guess what, I moved to the other side of it this summer! Most of the time it didn't take that long to get through and sometimes I welcomed the few extra minutes. The round-about already seems to be very effective. And for the reasons mentioned in your story it does seem the best solution. Thank you for the information. Well written!